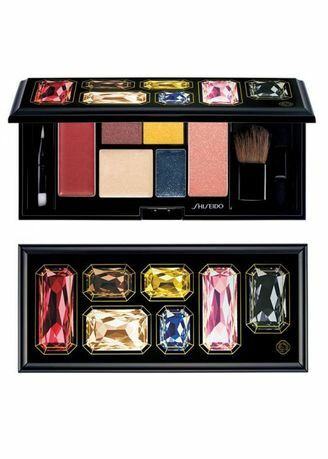 Shiseido’s Sparkling Party Palette is designed to resemble a bejeweled clutch, but don’t be fooled, because the gems are printed on the black glossy casing and not in relief. Certainly it would have been much more luxurious if there were actual faux gems on it, but it probably would not be very practical in a slim evening clutch. The palette consists of a lip and cheek cream color, 2 powder eyeshadows, 2 cream eyeshadows, 1 powder blush, a dual-ended sponge-tipped eyeshadow applicators, and a mini cheek brush. It seems like the trend this season to have these multi-purpose cream and powder palettes, and Shiseido’s Sparkling Party Palette is the slimmest and most useable of them all.